In the September-quarter 2016, Australia recorded negative GDP growth (-0.5 per cent). Over the last two years, employment growth has been flat and over the last 12 months, full-time employment has dived. Underemployment has risen sharply while unemployment remains at elevated levels and participation at depressed levels (meaning hidden unemployment has risen). And over the last four quarters, wages growth in Australia has been at record lows. Sounds bad. Well for some – make that most of us. But yesterday, the ABS shone a light on one cohort of income recipients – capital – profits rose in the December-quarter by 20.1 per cent. What? And wages fell by 0.5 per cent. Phew, I thought there might be some sharing of the spoils going on – you know, the top-end-of-town letting the workers in on the action a bit. This data comes as Australian workers are being shafted by rises in energy prices as a consequence of large companies, many foreign-owned, being given carte blanche to our national energy resources. A major union’s response today has been to call for a gas reservation policy to guarantee domestic supply (which is waning as we export our heads off). Unfortunately, while the call appears to be based on reason – lower prices, guarantees to local industry etc – any move to a domestic reservation policy would slow down the shift to renewables and just shift profits from export to import operations. It is not the sort of regulation that a progressive should support. Yesterday, I discussed the recent decision to cut legal wage rates for more than a million of the lowest-paid workers in Australia – Disgraceful cut in wages for more than a million low-wage workers in Australia. And, also yesterday, the Australian Bureau of Statistics released the latest – Business Indicators, Australia – for the December-quarter 2016 as a precursor to tomorrow’s national accounts release for that quarter. Here is a graph that captures what is wrong with neo-liberalism. 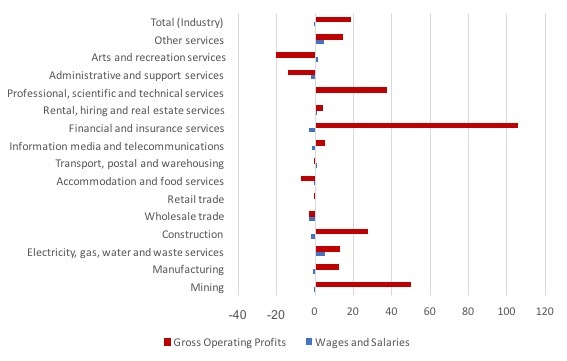 It shows the percentage change in wages and salaries (blue) and gross operating profits (red) for all sectors in Australia in the December-quarter 2016. For workers, their real wages went backwards given inflation is running around 1.5 per cent. For capital, they boomed. Here is a breakdown by sector of the same data. It is hard to see the wages outcome because they are so small and mostly negative. Mining profits grew by 49.9 per cent while wages and salaries fell by -0.8 per cent. In Financial and Insurance Sector profits rose by a staggering 105.4 per cent while wages and salaries fell by -3.1 per cent. In Construction, profits up 27.5 per cent, wages down -2.3 per cent. And so it goes. And, given this data, you would be shocked then to know that the Australian government’s main policy agenda (other than to make life hard for the poor, stack the national broadcaster’s board with mining business types with no experience in broadcasting etc) – to cut company taxation by $A50 billion (that is, lots). And what about Mining? The Australian government is into climate change denial like many and is pumping public cash into coal mining ventures just to show how it can give the bird to the ‘Greenies’. Mining profits are booming but Australian’s get very little of that action. Why? A huge proportion of mining operations in Australia are foreign-owned and the conservative government scrapped the mining tax to make that discrepancy even more stark. A report a few years ago estimated “that overseas interests own about 83 per cent of Australia’s mining industry” (Source). The industry claims that a high proportion of the profits are “reinvested into expanding Australia’s resources sector”. While the proportion is disputed it is rather moot – mining produces very little employment (relative to total), causes massive environmental damage (just take a small plane flight over the upper Hunter Valley west of Newcastle to see it), and pays very little back for the use of our resources. Further, the reinvestment also results in a “further increase the level of foreign ownership”. And where it does go to buy equipment and heavy machinery “much of the expenditure on heavy mining equipment goes overseas”, given our lack of a capital equipment industry. To put this into a wider perspective, last week, the ABS published the latest capital formation data – Private New Capital Expenditure and Expected Expenditure – for the December-quarter 2016. 1. Actual new capital expenditure fell a further 2.1 per cent in the December-quarter 2016, and by 15.5 per cent over the 12 months to December 2016. 2. Investment in Buildings and structures fell by 4.1 per cent in the quarter and 25.5 per cent over the year. 3. Expected investment for 2016-17 is 9 per cent lowere than in 2015-16 and 3.9 per cent lower for 2017-18. So investment is not going to drive any growth over the for the foreseeable future. This is all background to the next issue. 1. Why Australians are being forced to pay higher prices for natural gas we produce ourselves than foreigners who use the same natural gas (that we export)? 2. Why, when there are electricity blackouts being imposed by the national authority in Australia, which are damaging enterprises and households, are we exported natural gas while at the same time, some of the energy companies are being forced to import it at higher prices, just to keep the turbines running? It has been a long-standing scandal that the conservative government (and the Labour Party when it was in power) refuse to introduce reserve rules on gas supplies for domestic use – before exporting can take place. Australia ranks as one of the only nations that allow foreign-owned corporations to mine for domestic gas and then export it without any domestic use priorities being imposed. Now should we worry about that? Definitely, if we export gas but then experience domestic shortages. Which, then allow energy companies to drive up the local consumer price, which hurts all but disproportionately hurts low-income users. I wrote about the problems our electricity industry is having with continuity of supply and how it is becoming prey to financial market manipulation in this recent blog – Market manipulation and electricity blackouts. This morning, the UK Guardian article (February 28, 2017) – High energy bills here to stay but jobs heading overseas, industry group warns – reported that “The “staggering” increase in energy costs faced by households and businesses will continue thanks to rising gas prices, putting jobs in jeopardy”. The claim was made by an industry group who have a vested interest in maintaining coal and gas as the primary energy source. The high and rising price of gas means that existing gas-powered [electricity] generators will be significantly more expensive … The electricity market’s design means that gas generators often set the price for the whole market. And as they generate more often with more expensive fuel this is translating into higher average prices. Having just spent $200 billion over the best part of a decade to become the world’s biggest exporter of LNG, Australia is now looking down the barrel of having to import gas for domestic users. 1. Australia has abundant supplies of natural gas. 3. “Wholesale prices are looking like being more than double where they were 3 or 4 years ago” so “domestic gas users will pay more”. That situation will continue unless nothing changes. Discussing energy prices is difficult – but one thing is certain – the costs of production of carbon-based energy sources (coal and gas) are understated by a large margin because they exclude the environmental damage. Add that back in and renewables look decidely more advantageous. But international comparisons show that despite being one of the world’s largest sources of energy, Australian consumers pay among the highest prices in the world (Source). In an environment of rising prices and energy shortages (now manifesting as blackouts), a major steel CEO said last week that Australia was on the brink of an “energy catastrophe” (Source). We can dispute the baseload claims but the future is clearly not going to be coal, despite what the climate change deniers are claiming. Australia exports most of its natural gas to Japan, China and South Korea, all large users. Japan and South Korea have no domestic supplies of LNG. This has allowed exporters to enjoy higher prices and have no ‘market’ incentive to supply into the domestic market. There is also analysis to show that several large companies (for example, Incetic Pivot) have decided to locate elsewhere because of the deteriorating energy supply issue in Australia. One should not overstate these locational decisions, however. Australia will be better off in the long-run if a number of these polluting companies disappear (they will have to disappear). One suggestion for change came via today via a demand from the Australian Workers Union, which among other things is a right-wing group (one the larger unions in Australia) and conservative on social issues and, historically, firmly, anti-communist. Anyway, it was reported today – Prime Minister Malcolm Turnbull urged to secure natural gas for Australia as exports threaten jobs – that the AWU was calling on the Federal Government to introduce domestic use prioritisation of Australian gas. See also – AWU calls on Malcolm Turnbull to renegotiate contracts with gas exporters. Multinationals should be forced to renegotiate lucrative contracts that allow unrestricted gas exports in a bid to avert an energy security crisis. Which brings us to the long-standing debate about so-called domestic reservation policies. Only Western Australia and Queensland currently have any “form of domestic gas reservation” (Source). The Federal government last considered this issue when Labor were in power (2012) and rejected any further reservation initiatives. The conservatives at the Federal level oppose reservation. It is claimed that by imposing domestic reservation which “would guarantee a quantity of gas be supplied domestically, irrespective of domestic demand”, prices will fall. The only losers are the price-gouging energy companies, who then claim that investment will be lower in future developments (bringing higher long-run prices). – One in five heavy manufacturers will shut down within five years. Total manufacturing production will be reduced by 15.4 per cent by 2023. 91,3000 jobs will be lost in this period as a direct result of manufacturing shutdowns, with 235,000 jobs to go economy-wide. – Australian gas profits will be directed offshore – only 18 per cent of Australia’s gas will be extracted by Australian-owned firms (including BHP which is only 58 per cent Australian). Gas profit ratios are also astronomically high compared to other related activities (coal, iron ore). But WA’s gas prices, while lower initially, have now skyrocketed along with the prices in other states without a reservation policy. There is contradictory evidence about Western Australia’s policy. See Domestic Gas Reservations: The Facts. So what should we make of this call for a reservation policy? Whether gas prices would be lower or not (and they probably would be), the energy future is going to be renewables. Unless the Federal government persists in throwing billions at so-called ‘clean coal’, there will be no more coal-fired powerstations built in Australia. Eventually, gas is eventually going to lose out on price to renewable sources (wind, for example), unless the price is kept artificially low by a local reservation policy. The reservation policy would force some of the low-cost (excluding environmental costs which are ignored) gas now being exported to be consumed in the local market. This would provide profit-guarantees to local producers at a time when we want the price signals to be working to encourage further investment into renewables. With coal on the way out, a reservation policy would encourage consumers to use more gas, which frustrates the transition to renewables. Why would the AWU pursue this line then? Well apart from being a conservative right-wing group with mindboggling attitudes to social matters (gays, abortion, etc) their roots were in the mining sector of the C19th and the conservative rural sector. Remember back to 2014 when the debate centred on a Renewable Energy Target (RET) and the AWU supported American alumimum manufacturer’s demand to be exempt from the scheme until 2022 (Source). So how does a progressive think about this issue? A. Without significant new regulation, technology and consumer sentiment (in favour of renewables) will drive coal and gas out on price alone. Not completely and not quickly. In the short- to medium-term this will mean the high gas prices will continue to hurt industry and low-income consumers. But that is the problem with these ‘market-based’ solutions – the changes have to work through the price system and the change dynamics come from hurt – lowering real incomes and squeezing people on the margin to change energy behaviour. My bet is that process will not be fast as long as carbon-based energy sources do not have to pay for the environmental damage. B. Impose regulations and ownership constraints. 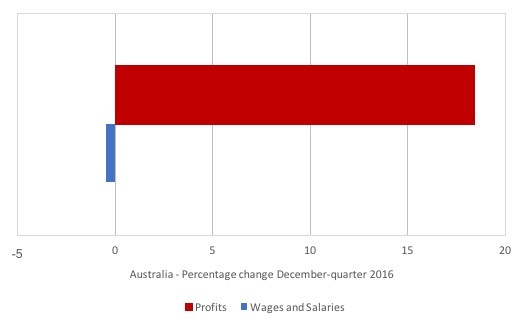 The data released yesterday on wages and profits (cited above) should tell us that things are askew in Australia. A situation where profits boom and wages collapse cannot be defended in any progressive way. Especially when the sectors experiencing the largest gains in profits and falls in wages are either most foreign-owned or majorly unproductive (finance). As a long-term strategy, I would rather see unions demand nationalisation of the nation’s energy resource extraction as an interim measure, regulate coal out of existence, and invest significantly in new state-owned renewable energy projects (from creation to end-point). In the case of gas, private profit would no longer be the driving force for investment and export-domestic decisions and reservation policies would be unnecessary. The Government would require the state-owned operation to ensure national well-being was the number one priority after environmental sustainability was satisfied. Gas would only be supplied until baseload could be handled through renewables with storage options. That day is not far off. The data showing booming profits at the same time as falling wages is deeply disturbing. It is the neo-liberal dream – but a myopic fantasy at that. Eventually, these dynamics will come back to destroy this mindless approach to economic life. Government intervention can speed up the process – that will come as well – once the pollies work out which way the wind is blowing. The energy sector (implicated in the profit grab) will become a major manifestation of this changing sentiment. This is criminal negligence of Australia’s interests. All of our politicians involved in this over the years should be held accountable. It’s conspiracy with corporations to defraud the Australian people. Great article. I note the LNP’s Josh Freidenberg is trying to distract by advocating fracking. Criminal incompetence again from our politicians!!! I don’t think the old saying that one gets the government one deserves holds any longer. It’s way worse today than that. I’m not sure I agree with the idea that renewables will be much of a panacea. Wiki has an article, the Cubic Mile of Oil concept. The truly mind boggling use of energy can hardly be comprehended but the CMO gives some idea. I don’t know the exact figures for now, but we used a CMO in 316 days, just petroleum. On top of that another similar amount of coal and gas is burnt. In total, 1 years energy supply is closing in on 3 CMO. The electricity generation equivalent of 1 CMO, in hydro terms, means building 200 more dams each the size of China’s Three Gorges Dam. It should be obvious we cannot do that. The renewable industry is like a few coats of paint on a CMO container. It is just unrealistic to imagine more than local uses for renewables. Also creating renewables at the same time as running the existing energy machinery is doubling up on using energy. And then we have a growth obsession to deal with. With the IMF recently forecasting annual worlds growth at 3.5%. our energy use is set to double in 20 years, to over 5 CMO. There is no way renewables can keep up. In fact our whole civilization is in a parlous state. But don’t tell the pollies, no way could they handle that! Any forecast on the December GDP growth figure ? Bill – as one who has worked in heavy industry I can tell you that you are overlooking a very important fact re gas reservation. There is a misunderstanding that gas is used entirely as a source of fuel for electricity turbines – this is not correct. Natural gas is a very important raw material input (chemical) in itself for many industries and often has no substitute. I worked at a plant that produced half-a-million tonnes of ammonium nitrate per annum (which goes into things such as mining explosives and fertilizers) for which gas is required. No gas or gas becomes too expensive – the plant shuts and the workers are out of a job. Gas is important in non-ferrous metals production, plastic production, even some building materials. Gas is superior for some kinds of industrial furnace and heating operations, in some cases it is the only thing that works. It also isn’t rare for some electricity-hungry industries to utilize their own mini gas turbines to produce their own power more cheaply then taking it from the grid. Industry claims that nearly one quarter of a million Australian industry jobs are dependent directly on gas, with close partnerships with others that employ a further half a million. I’m uncertain as to the accuracy of these figures but I’m very certain that gas is important to a significant number of Australian jobs. Regarding the failure of the WA gas reservation policy, I haven’t looked closely but it appears to be a similar situation to the laws supposed to prevent well-heeled foreign investors from buying up pre-existing homes in Sydney and Melbourne – those responsible for enforcing the law appear to simply choose not to. In short, now that we have a gigantic gas cartel on the east coast, hoovering up domestic reserves to meet it’s massive international supply contracts, creating local shortfalls and driving up the price to the extent that our own gas sometimes costs us more right where it came from the ground than it does when we offload it in Japan – we either put some aside for our own use at a reasonable price, or watch industries that employ significant numbers of Australians fade from existence. I understand that our sovereign government could replace all the growth that leaks out of our economy through imports if it chose to do so – but we really need to think hard about whether the voluntary regression into total dependence on those half a world away that we seem to set an unwavering course toward is wise and in our best interests. If I have understood your approach to this topic correctly, I liken your approach to saying drugs are bad, so lets give all drug takers a \”hotshot\” and end drugs as a problem completely. My understanding of MMT is that if resources become constrained then we get inflation. The use of Price Parity (ie regulated, not market derived pricing) of Fossil Fuel reserves exposes Australians to a massive potential inflationary burst as world conditions will set our price, many of which can happen almost overnite, precipitating massive collateral damage as our central bank will attempt to control inflation with interest rate increases. Domestic factors no longer set our prices, many of these conditions are beyond our control (eg war). A strategic reserve is a very good way of protecting our industries and interest rate sensitive community to the aforementioned inflationary outburst. Would it not be a good method of maintaining community stability? I have understood that in MMT taxes are used to gradually shift from negatives to positives (eg land value taxes to capture economic rents), why would u not suggest that in this case? I also find it disturbing that you have become the magistrate and decided that climate change requires this level of attention and what needs to be done, surely someone working in the academic field understands how our universities, research facilities and thinktanks have been captured by vested interests? Only just tonight the ABC ran a story on CSG research undertaken by the CSIRO and funded by the CSG industry, is that not an unbelievable set of circumstances, especially considering there is ample funding that could be sourced by our gov\’t through its fiscal policy for this needed research. I\’am not advocating for the fossil fuel industry, however I feel we are sitting ducks when it comes to security and any change to renewables needs to be done in a gradual and measured approach so as to minimise harm to our communities. sorry Professor Bill, I don\’t agree with you on this one. Incitec Pivot are fertilizer manufacturers. I think you will find their decision based not merely on the cost of electricity but on the raw material input – gas – needed to manufacture the fertilizer. Inasmuch as they can be harmful to the soil in the long run – are we really going to allow our very ability to produce food on this isolated island of ours to become dependent on fertilizer imports? Especially with agricultural produce being one of our important exports? Guys – we MUST put some gas aside for our own uses. Not so much for electricity (renewables will ultimately cover that) but for a wide variety of industrial uses that cannot be substituted for. The drive for fracking has been necessitated by the huge hunger of the export cartel. Our own domestic consumption would likely require little of this process. Australia has abundant supplies of gas and coal. The latter is an especially filthy fuel and needs to be phased out urgently. Gas is somewhat cleaner than coal although still polluting. It is a useful interim fuel and feed stock until we can develop clean alternatives. I have always thought that it is crazy to export gas when we need it ourselves. Of course,greed and stupidity win the day,as usual. As for renewables (aka unreliables) taking over base load electricity generation, it won’t happen. In case you haven’t noticed,the sun is only with us for a maximum of 12 hours out of 24 and is frequently obscured by cloud. The wind doesn’t blow 24/7 at anywhere near a constant usable strength. Enormous and scarce resources can be expended on building solar and wind generation facilities with storage and transmission. They inevitably have a large and damaging footprint and still need fossil fuel backup. Nuclear is the only practical alternative. But our stupid and ignorant PC Pixie element can’t/won’t see that. Hmmmmmm, maybe we should wait for those three missing reactor cores at Fukushima to be found and neutralised before declaring nuclear to be the future.